It offers island-bed, end-washroom luxury in a classy package – join us inside to see if it delivers! 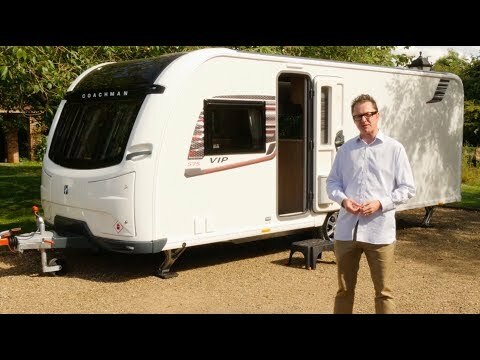 Of all its ranges, Coachman’s flagship VIP receives the most improvements for 2018. A key difference over last year’s line-up is that VIP’s head count grows by three, as a result of the twin-axle Laser being retired. This means that the VIP offer now encompasses single- and twin-axle tourers – Laser’s ‘6xx’ numbering is continued for easy recognition. As a result, nine models comprise the new VIP range of Coachman caravans for 2018, including a family-friendly floorplan – yes, really – the rear bunk/dinette 570, which will take a bow at the autumn NEC show. So what better time for a proper design and spec revamp, especially as VIP has been largely unchanged since 2012? In come new bodyshells with a new graphics scheme, plus new aerodynamic front panels and side windows. The rear panels are new, featuring buzzy road lights, and the grabhandles front and back match the grey colour used on the front skirt. We’re going to look at all these changes in the form of the island-bed VIP 575 four-berth – Coachman’s best-selling model. As one would expect, the VIP 575’s underpinnings are impeccable. Riding on a galvanised steel Al-Ko chassis, the caravan sports a wide array of added Al-Ko goodness, including the ATC anti-snaking system. Many users will welcome the buttonless handbrake, and the heavy-duty corner steadies have easy-to-access bolts. For optimum ease of use, all the ‘business’ connections (mains hook-up, water and toilet cassette) are made are on the offside of the van, with the ‘sociable’ items (external gas barbecue point and external 230V mains socket) on the nearside. These are covered with ‘Easy Slide’ covers by Whale, which won’t flap during towing. In a departure from the 2017 van, the two gas bottles now stow in a locker at the nearside front corner. A new control panel is fitted above the single-piece caravan door, to the left of the Alde heating touchscreen. First impressions matter, and we reckon that the Coachman VIP’s 2018 lounge is more cheery than last year’s. And it’s been achieved by making subtle changes. Orange piping in the lounge seats and in the curtain tie-backs and scatter cushions is more upbeat than last season’s brown. And replacing the grey stripe in the overhead lockers with a cream one has had a similar effect. The front shelf and centre chest section, however, is all new. The wide shelf will take cups, mugs, glasses and even a flatscreen TV. The centre chest’s extendable section has been re-engineered – there’s no hinged tip-up section any more. Instead, it slides out elegantly in one fluid movement. Located higher up, though, is surely the lounge’s USP: a super-wide panoramic sunroof that Coachman says is the widest on the market. Other highlights in the lounge include the use of smart grey mouldings to frame the front windows and ‘quarter-light’ corner storage lockers. Smart aluminium handles are set into the cream-faced bottom sections of the locker doors (preferred to last year’s grey), and the low-energy consumption LED lighting includes four spotlights. Both keen and committed cooks will feel right at home in the VIP 575’s offside midships kitchen. Aesthetically, it looks pleasing, with white locker facings and cupboard doors differentiating the kitchen area from the rest of the van – a carry-over from 2017. Smart low-profile Fenix NTM worktops look the part and feature thermal healing properties to ‘heal’ scratches – work surface is at a premium, but more is available above the fridge on the nearside. Catering equipment comprises an oblong sink with a smart mixer tap plus a new – and Coachman-branded – drainer. The Dometic dual-fuel cooker with separate oven and grill is new to the VIP range for 2018, and sits to the right of the worktop, but there’s only one 230V socket, to the left of the sink. Across the aisle is a dual-fuel 99-litre Dometic fridge, under a high-set microwave. Other kitchen items include an Omnivent, above the cooker, and a strip of LED task lighting on the underside of the offside overhead lockers. Entering through a sliding door at the end of the island bed, a swivelling Dometic cassette toilet is immediately on the left, under a frosted window. The vanity unit, located between the toilet and the shower area, is a worthy centrepiece here. It features three mirrored panes, two acting as side-hinged doors to a storage centre for lotions and potions. To its right is a large, moulded shower cubicle, accessible by means of a single-piece plastic door. There’s plenty of space for dressing in here, and with its central heating radiator it’ll be warm, too. With its transverse island bed, the 2018 Coachman VIP 575 offers buyers supreme sleeping comfort without the penalty of a longer caravan body. At over 6ft, the bed should suit most users, and it has a comfortable mattress. It’s really easy to switch between the bed’s ‘day’ and ‘night’ positions, thanks to a filler cushion that pops in and out with ease. Overnight guests don’t miss out on a good place to sleep in the 575. The parallel sofas in the lounge are brought together via sliding slats to form a large (6'2" x 4'5") double, or can be used as 5'0" x 2'4" single beds for children or teenagers. Runs of overhead lockers spread around the 575 provide storage for lighter touring items. The kitchen has three wide drawers beside the oven and grill, next to a vertical cupboard that houses the lounge table. There are also cupboards in the washroom, bedroom and kitchen, plus a pair of half-length wardrobes bookending the island bed. Handy external storage, for items like a hook-up cable and outdoor shoes, is provided in an external front corner locker. Coachman knows a thing or two about building upmarket caravans, and the VIP 575 boasts a raft of refinements inside and out. With rivals from the Lunar Clubman and Elddis Crusader ranges very much in the game, this is a timely update. We like what we’ve seen here and believe it will draw some new buyers to the brand. But will this upgrade find favour with Coachman loyalists who may prefer a more traditional look and feel? Time will tell.